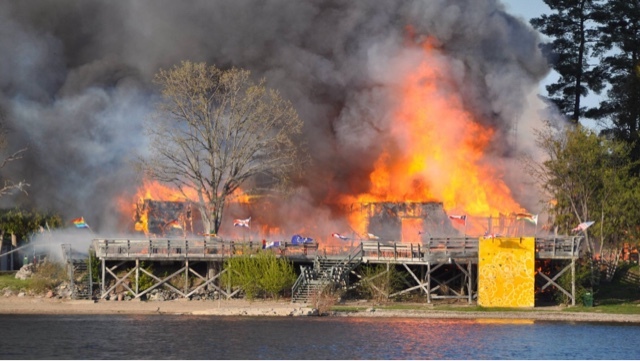 HOT TIMES ON THE OTTAWA RIVER~ How Esprit Rafting Survived the Fire. byGreg Pippett, with Ian Bailey | DBP MAGAZINE ONLINE The World's Best Free Whitewater Publication. 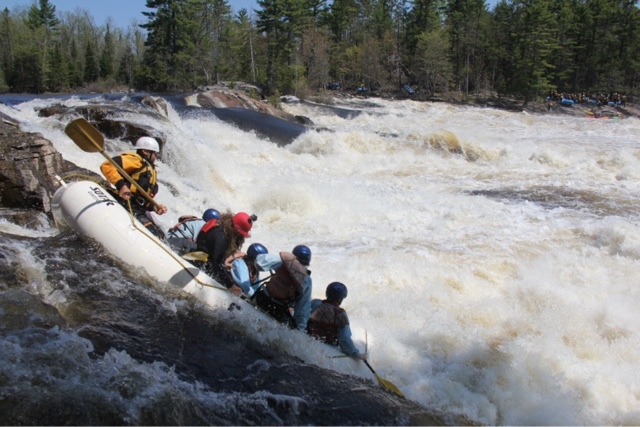 This May, on Friday the 20th, the Esprit rafting team members were returning from a big training day, polishing up their lines on both the Petawawa and Ottawa rivers in Canada. The bus had stopped at a gas station to fill up when a call came in, bringing us the news of a fire at our basecamp. Initially when we were told that Esprit was on fire; nobody was really sure about the extent of the damage. We optimistically presumed it would be contained and continued our journey back towards base. The last ten minutes of that bus ride was a strange mix of speculation, optimism and nervous jokes, but it was not until the final kilometres, when we could see the peninsula of our base, that we realised the reality of how big the fire was. In the last minute or so we got a glimpse of the fire and destruction that was once our rafting base; electrical cables sparking as they came down, thick black smoke billowing from the building and nothing but charred remains to be seen through the inferno, a site that once held a 70 year old lodge, dear to the heart of many in the local community. As the bus pulled in, fuelled by concern of what we would find at the other end of the driveway, we all began to run down to assess the situation. Everybody wanted to help where possible and salvage whatever we could. Realising the significance of the situation and laying eyes on the scene, our minds lead us to some of our endangered most important personal items. For Esprit trip leader Jesse, it was his dog; for me, my passport and vegemite; for Ian, his new toothbrush and DBP cap; and a variety of other items for our other guides. The four local fire departments that had all rushed to our aid quickly deflected our concerns, Saidy (Jesse’s dog) had been saved and all of our other less significant concerns were less of a priority. 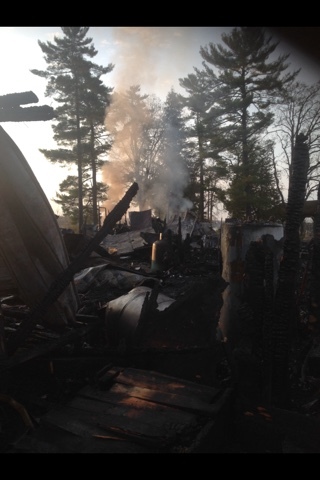 The scene had been deemed unstable due to the potential explosive hazard created by three full, highly explosive propane tanks. At this stage we all began to regroup, discussing what we could do and attempting to piece together the story of what had happened. Although the source of the fire is unknown, one of the first on the scene was Josh, who after attempting to extinguish the blaze (while fellow Esprit employee Justin called emergency services), joined other staff in evacuating everyone from the building. Josh then heroically managed to salvage two pints of beer from the bar – a tale that is sure to become local folk law. After realising there was little for us to do that wasn’t being managed by the local fire crews, our attention turned to Esprit owner Jim Coffey for instruction and direction, a man who just saw 25 years of work and memories disappear in smoke. Despite the chaos and ambiguity of the future, Jim seemed remarkably composed. He consulted with a few staff members about logistical matters and returned to discuss the situation with the guide staff. Jim gave us all roles for the night in order to get ready for the following day’s trip. “The show must go on” was the message; there was no time to sit around worrying about what has or could happen. We had a trip to run and a lot of work to be done and Jim wasn’t going to let that be forgotten. It was about 8pm by this stage, and a lot of work had to be done: clients were being informed of the situation, police reports and interviews were underway, customers staying at the hostel or in the campground were having other accommodation organised and being shuttled over to them, and of course food for the trip the following day was being bought and organised. A shout out to our friends over at Horizon X Rafting is necessary as they willingly housed some of our guides that night, and assisted in food preparation and stored our lunch overnight. Two of their guides brought it along with them on our river trip that they worked for us. Perhaps one of the most unique memories I have of this day involved a few staff, exhausted at 11 o’clock after a very long, complicated day. We were in a warehouse full of all of our gear which is down the road from our base and luckily remains unaffected by the fire, content and comfortable that we were ready to go the next day. We were finishing off pumping the rafts and packing the buses for two separate river trips we had going out, coming to terms with the situation, and enjoying each other’s company over a quiet beer. There seemed to be an unspoken readiness, that despite the uncertainty and adversity everything was going to be fine. The next morning we woke up early and ready, smoke still pouring out of the wreck that was our old base. There were two four-boat trips to be run, one on the Petawawa River and one on the Ottawa River. As most of the gear had been organised the day before, roles were rearranged so that staff were able to be freed up to redirect customers to alternate meeting points and organise a wide array of unusual problems that come from having a rafting base burnt down. A gourmet breakfast for guides of peanut butter sandwiches, fruit and gas station coffee was served on Jesse’s tailgate, as the trips began to get organised and take place. Confusion from the local area and customers was understandably difficult to manage; many were unsure if we were still rafting, many volunteering help services and many concerned about how our rafting operations were going to pan-out. The good news is, rafting operations continued successfully that weekend as Esprit took out a total of 16 rafts of satisfied customers, and that is not where it ends. 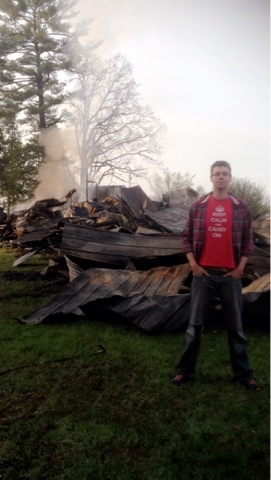 The damage of this fire extends beyond the whitewater community. 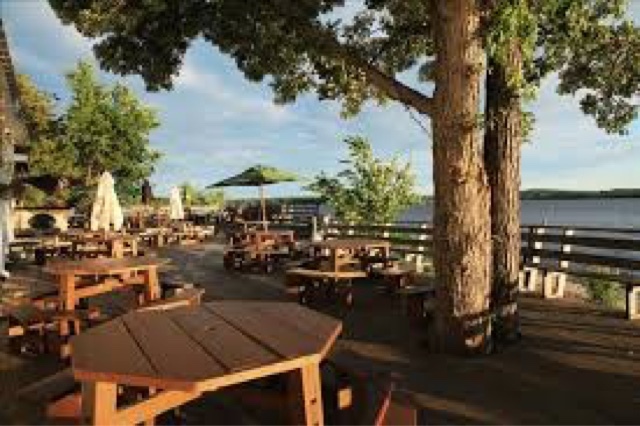 Esprit’s bar and restaurant operated as a valued social hub for the local community, as a source of live music, great food and an awesome bar/deck atmosphere for many years. The community is at a great but temporary loss. We have received overwhelming support and are graciously accepting it. Fortunately, through the help of many generous volunteers and hardworking staff, we have resourcefully created a makeshift office, and the process of resetting and rebuilding has begun. Esprit will be running as always, plenty of trips, providing great whitewater experiences. The show does go on, and as a company, Esprit will rise above these circumstances and continue to be successful. For more details on this event there are articles and information on both Esprit’s facebook page and website. If you are interested in supporting our cause, share our story, and encourage others to come experience our program, there is also a crowdsourcing page (link below) and any financial assistance is also greatly appreciated. Ian Bailey, who assisted on the editing of this article as well as dealing with the actual fire, is a guide at Esprit and a gifted writer in his own right, and contributor to this Magazine. Check out his awesome site IBOUTDOOR for stories from around the wide world of adventure sports! Our charity “Whitewater Healing” has been nominated for an award in the canoe kayak magazine paddle with purpose competition. The brainchild of Jim Coffey, Whitewater healing aims to provide free whitewater rafting trips for children with autism, to allow them the chance to share in the experience of the river. Would you be able to share this link please and encourage people to vote for us?